The chakras are energetic building blocks that flow through all aspects of us and of our planet. In this post, I’ll be covering what these energy centers mean in the context of your body and the world. My goal is to provide a framework for your own, personal, understanding the chakras. I’ll also be sharing how you can integrate your knowledge of the chakra system into your day-to-day life. Keep reading for al the details and click here to join me for the full Chakra series. Just as our physical bodies house the chakras, the entire universe is composed of spinning wheels of energy. Trees, flowers, animals, even furniture. Everything is made up of tiny particles. Everything has tiny wheels turning inside them. We inhabit the biggest spinning wheel of all, the Earth, a planet spinning through space. If we begin to accept that everything is truly alive, then the invitation to explore the chakras as a lens through which you can integrate the body, mind, and spirit together is a natural progression. Because the chakras exist inside us and everything else, they fuel our sense of interconnectedness. The pathway of the chakras IS the pathway of personal and spiritual development. A definition of the word chakra that I love is from one of Anodea Judith’s books. She writes, “Chakras are organizing centers for the reception, assimilation, and transmission of life energies.” I love this quote because it illustrates that the chakras process what’s going on within us and affect how we interact with the world. Each of your chakras influences how you act in your day-to-day life. Think of each chakra as computer programs that governs different areas of your life. We all have an ingrained way of being that might be the result of many different things – whether it’s simply the way we are or a product of our past conditioning and the way we were raised. We all have a program. You have a default “love program” (in your heart chakra) that runs in your relationships and a go-to “fear program” (in your first chakra) that activates when you’re scared. Becoming aware of these energy centers is another way (along with yoga and meditation) of healing ourselves of old patterns and behaviors that are not serving us anymore. In rebalancing a chakra, you are reprogramming your habitual behavior. This is why you can think of the chakras as a framework for awareness. They’re framework to explore your own behavior and programming, and a beautiful way in which to approach change. Not prescriptively, but holistically. Now that we understand what the chakras are and how they govern our actions and reactions, let’s go deeper. These chakra wheels are not just spinning in isolation. Together, they’re a system of gears drawing us toward higher states of consciousness and to our true potential. We already thought of each chakra as a mini-computer. Now think of each one as a navigation tool. In reprogramming (or balancing) each chakra, you can point each one like a compass depending on what your goals are and where you want to go. I like to view the chakras as an empowering system that offers a framework for self-development. You might hear people discuss chakras as a way to diagnose themselves. They might say, “I definitely have a third chakra imbalance because of X Y or Z.” You can explore the chakras however you like (and self-diagnosing isn’t bad or wrong). Yet usually, imbalances are complex, nuanced, and effect more than one chakra. I try not to view or diagnose the chakras in isolation as a way to “fix” something that’s wrong, although that’s certainly one view point. I’d invite you to use the chakras as a framework for personal exploration and personal growth in all senses. Instead of fixating on one chakra or issue, I’d try to make micro-adjustments to the “programming” running each chakra in order to develop into the person you really want to be. In my opinion, when we rush to say our fourth chakra is “too open” or “too closed” it starts to veer into the territory of calling our thighs too fat or too skinny. Try not to get hung up on what you perceive as a problem area and avoid negative self-talk, always. I view the chakras as interconnected, just like the fascia that runs through your whole body. A chiropractor, for example, might adjust your bones and “pop” them into the right place. However, unless the myofascial structure that all of your bones and organs live in also changes, the fascial tension inside your system will pull those bones back to the way they were over time. Sort of like how if you don’t wear your retainer, your teeth shift back to the way they were before you had braces. All of the chakras talk with each other and are linked together. Trying to fix one in isolation might not be your best bet. One of the things I find the most fun about the chakra system is that it reminds me how all of the different aspects of my life are interrelated and working together. The chakras are an energetic system, but many say they have corresponding physical points. Each of the seven chakras resides near one of the seven major nerve ganglia that emanate from your spinal column. Very cool! If you’re getting confused, don’t panic. Simply think of the chakras as gateways between various dimensions such as your emotions, your thoughts, and your physical body. Yogic texts say that together the chakras power your auric field. Your “aura” is just a fancy way of saying where your energy blurs into the external world around you. When you meet someone and we talk about what their energy is like – what it’s like to be around them – that energy is powered by their chakras. What makes the chakras spin? We’ve already covered that the seven chakras form a vertical column from the bottom of the pelvis up through the crown of the head. But how are they spinning or moving?This vertical column – your spine – also houses what yogis call your Shushumna Nadi. Shushumna Nadi simply means the highway of energy running up and down your spine. For example, when we breathe and visualize a ball of light moving up and down our spine, we’re connecting with Shushumna Nadi. When we practice Kundalini yoga, we’re practicing moving energy UP our spine, through the chakras, to connect with higher levels of consciousness (or your own personal higher power). The vertical column of your spine also houses what yogis call your Shushumna Nadi. Think of your Shushumna Nadi as the super highway of energy running up and down your spine. When we breathe and visualize a ball of light moving up and down our spine, we’re connecting with Shushumna Nadi. When we practice Kundalini yoga, we’re practicing moving energy UP our spine, through the chakras, to connect with higher levels of consciousness. If each chakras were a freeway exit, Shushumna Nadi is the highway running up the spine, through them all. The two currents of energy moving up and down Shushumna Nadi are what yogis call Shiva and Shakti. It’s Shiva and Shakti – a downward current and upward current – that make the chakras spin. This downward energy is often called the current of manifestation. This energy starts in pure consciousness and pure awareness (it’s from above) and then travels down through the chakras to become manifested. It’s like the lightbulb that goes off above someone’s cartoon head. Say you have a great idea for something – maybe for a book (the lightbulb goes off). That idea starts up high in your head (or maybe even beyond your head if it feels like the idea “came out of nowhere”) and then moves downward, inching closer and closer to a tangible form. In order to actually complete the book, you’d need to write. Writing only occurs when you sit in a chair and make it happen, actively moving the idea from your head to the page. As you continue working with the idea, there might be other actions necessary in order for the book to take full form. Maybe you’d need a book editor. Maybe you’d need to develop relationships with other people, which calls upon the energy of the fourth chakra. Maybe you’d discover that you need more willpower and energy when you hit ‘writer’s block,’ which is in the realm of the third chakra. That’s an example of the downward current – an idea coming into manifestation. You take something from the abstract plane and make it real. The opposite current running through the chakra system is the current up – the current of liberation. If manifestation is the process of moving from the abstract to the tangible, then the current of liberation is all about matter becoming lighter as it moves up through the body. Liberation helps us expand, transform and tap into a sense of being connected with something greater than ourselves. In yoga and meditation, this is the current we’re often more connected with. We’re usually trying to move energy UP the spine. Both are currents are important. Liberation without manifestation might express itself as someone with great ideas who is unable to bring anything to fruition. Manifestation without liberation might be reflected in someone who accomplishes so much, but you can tell they’re a workaholic who’s disconnected with their true purpose. Chakras are centers in the body where both forces, liberation and manifestation, are mixing together in different amounts. The lower you go in the chakra system, the stronger the momentum of the manifesting current. The gear of chakra one is moving slower and has more downward energy than chakra seven. As we go up, the chakras are more influenced by the liberating current, therefore spinning faster. This polarity is essential to understanding the chakra system holistically. This is why fixating just on one chakra as a problem area in isolation, might not be beneficial. Kundalini and Shakti are two words representing your liberating current, often drawn as a snake coiled three and a half times around the base of your spine. In daily life, this serpent is dormant. You’re busy manifesting – doing your job, completing errands, getting stuff done! When you do Kundalini yoga, for example, you’re waking up the serpent and moving it UP the spine throughShushumna Nadi. Kundalini Shakti climbs the chakras and finally reaches the crown chakra at the top of the head. She waits there, according to yogic philosophy, to find Shiva (who represents divine consciousness, enlightenment, and bliss) descending to meet her. When they are together, you begin to feel connected to something bigger than yourself. That’s the great feeling yoga and meditation give you. Looking at it through this lens, saying a chakra is “blocked” or “imbalanced” means that Kundalini Shakti (the serpent) can’t effectively move through it. This is a lot of information, and there are multiple ways of interpreting the system. Try to have fun explore your own programming through this framework. Chakras are really just mini-computer programs that are running our entire lives, whether we are aware of it or not. How we act in relationships. How we act when we are scared. How much we trust our intuition. And now that you know about the current of liberation and manifestation, try not to get too hung up on one particular chakra that you think is a problem. Think of the quality of your energy overall. All of Anodea Judith’s books are great if you want to explore the chakras in more depth. This post is simply my own interpretation and an overview. 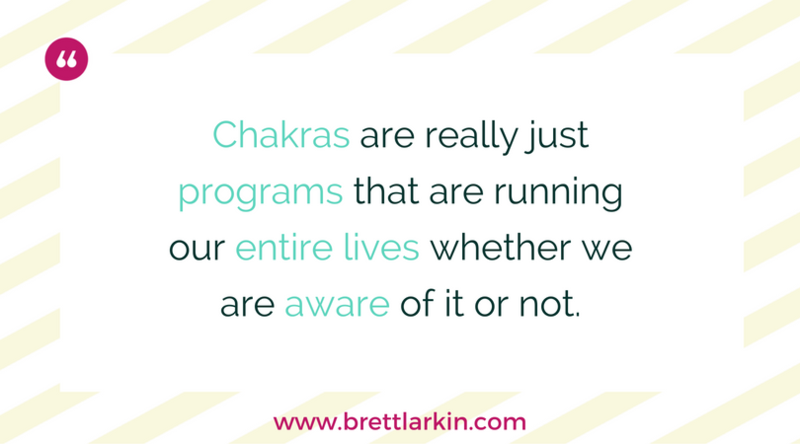 If you’re ready to go deeper with me on all things chakra, do not forget to sign up at brettlarkin.com/chakra. If you officially want to enter my community check out Uplifted at brettlarkin.com/uplifted to get bonus content on all the chakras and be supported by the most incredible community of people out there. I’m so appreciative of our community every single day. See you inside!